Five Nippon Ham pitchers, led by none other than Yu Darvish, combined for a no-hitter in a practice game against Korea’s Samsung Lions on the 25th. Darvish hit 154 kmph on the gun, and threw a curve at 94 kmph. I guess he came to camp in shape. I’m late on this one, but Orix ace Chihiro Kaneko has been injured since essentially the beginning camp. The Nikkan Sports report I’ve linked to indicates that righty complained of elbow on February 6th, and had surgery on the 9th. He’s rehabbing at Orix’s ni-gun camp. Given that Kaneko logged a career-high number of innings last season this is a bad sign. Masahiro Tanaka and Yuki Saito have crossed paths, but have yet to face each other. In more bad news for Orix, Mike Hessman took a Masahide Kobayashi fastball to the head on the in an intrasquad game 17th. Here’s hoping Mike is all right. According to Sanspo, Lotte has narrowed there list of candidates for their compensation player from Hanshin to two pitchers. A resolution is expected on March 1. Carlos Torres looked pretty good in his appearance against Yakult on the 27th. Here’s a link to the game on Justin.tv. And for something completely different: this collection of Japanese art and graphic design from the 1920’s and 30’s. 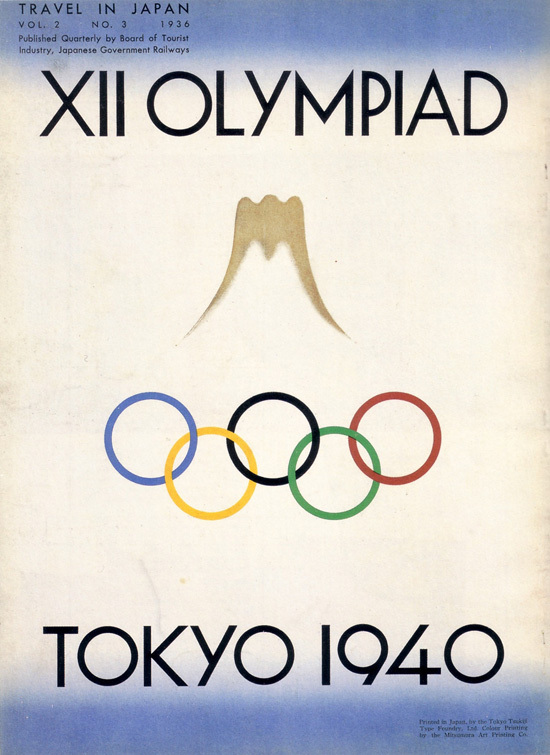 I like this poster advertising the cancelled 1940 Tokyo Olympics. Baseball was planned to be played as a demonstration sport in the 1940 Tokyo Olympics. Here is the history of baseball in the Olympics. For a second I was going to freak out when I saw the headline because I was like “Wait a minute, I know Kensuke broke his hand but I didn’t hear anything about Kaneko…” then I realized you weren’t referring to Makoto. Yeah, sad about Yonamine. I wonder how well Rob’s book about him has sold, it’s a great story. Since I’ve started this site my fan allegiances have mostly faded away, but I was still mad when Chihiro got hurt. For those who have time to kill, here is a documentary (in Japanese) about the 1974 Dragons managed by Yonamine who prevented the Giants, managed by his archrival Kawakami, from reaching V10. Yeah but that’s Keisuke Kaneko. Bad time to be an Orix player named Kaneko. I found Hessman perhaps the funniest looking name from an import (as opposed to a “Japanese export” to Major League, got it? ).